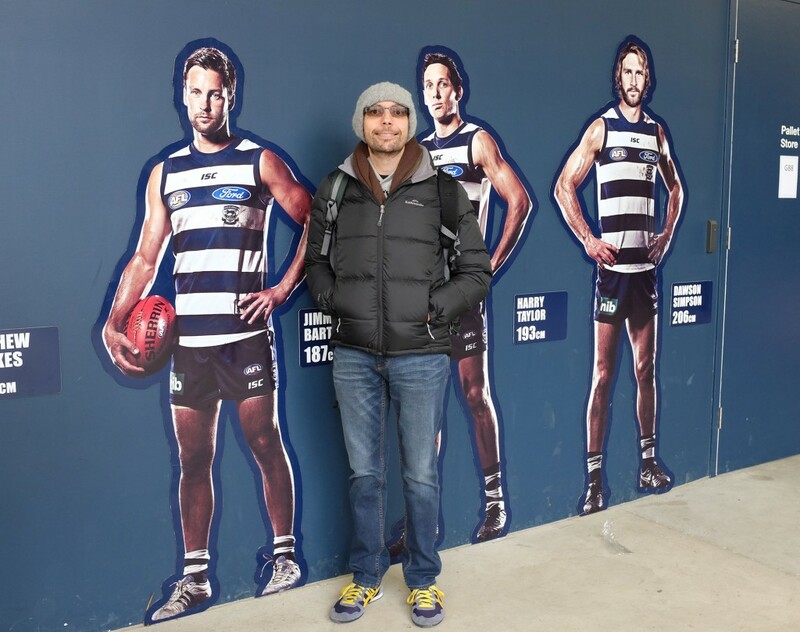 Since Mackie arrived, all the way from Hamburg, Germany, we have been introducing him to our national game….AFL Footy! 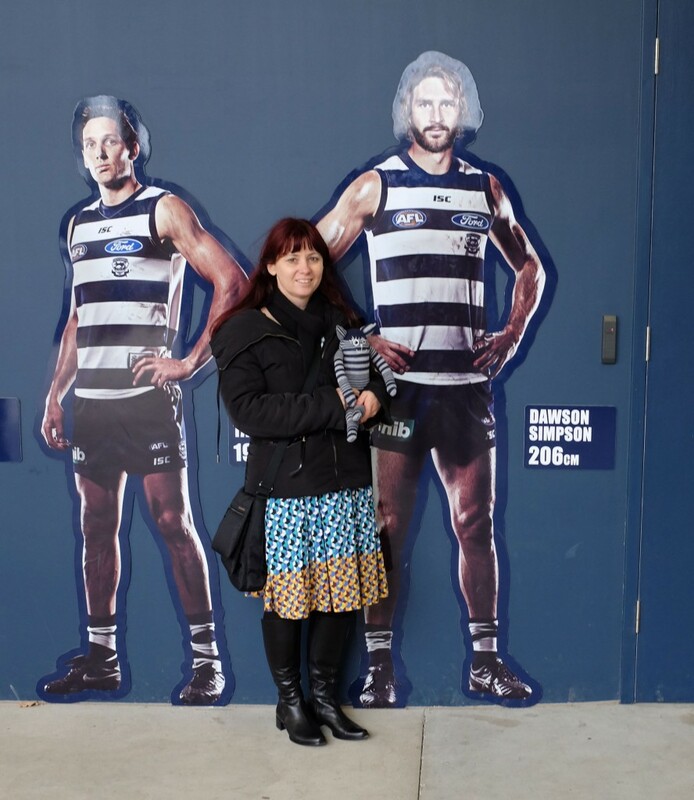 And as my husband and I are both Geelong supporters, Its not surprising that we named him after a Geelong player…Andrew Mackie! 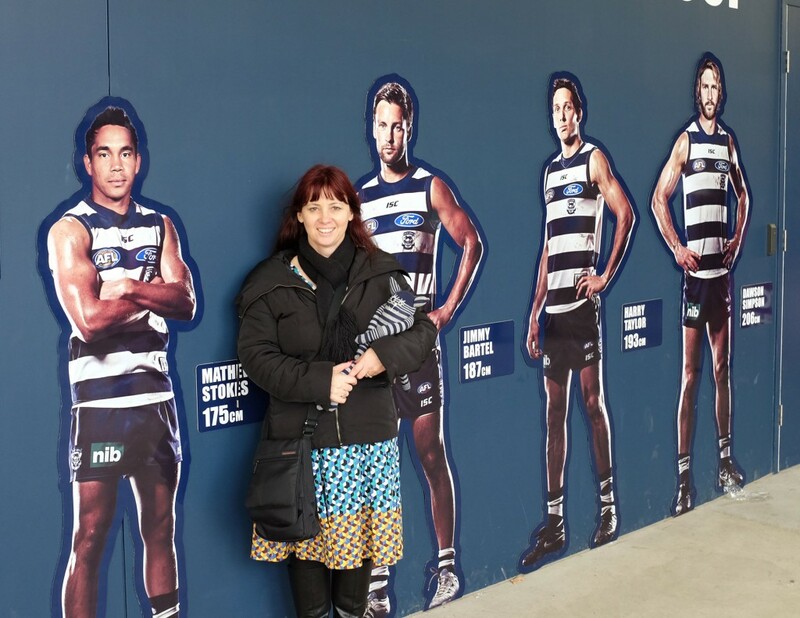 We decided to take our Mackie to the home of the Cats, Skilled Stadium, and maybe with bit of luck, we might be able to introduce him to his namesake..and get a photo! 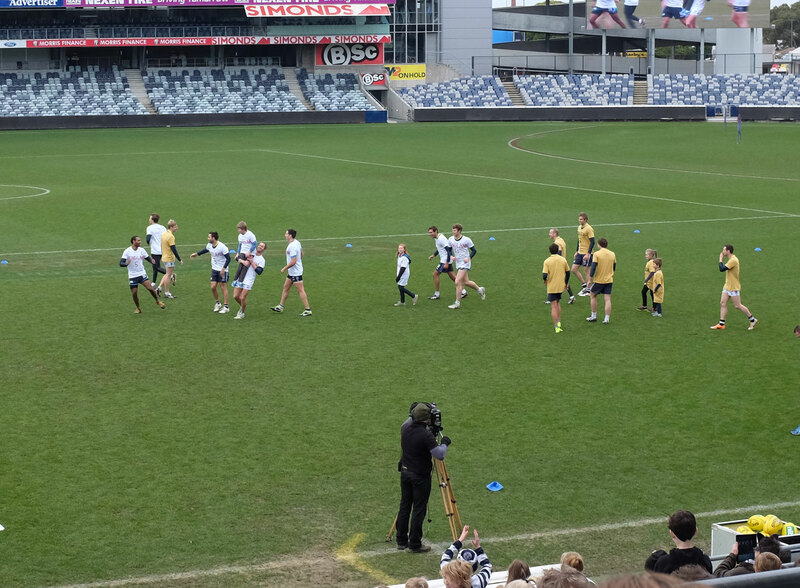 There was great celebration as one of the kids kicked a goal! 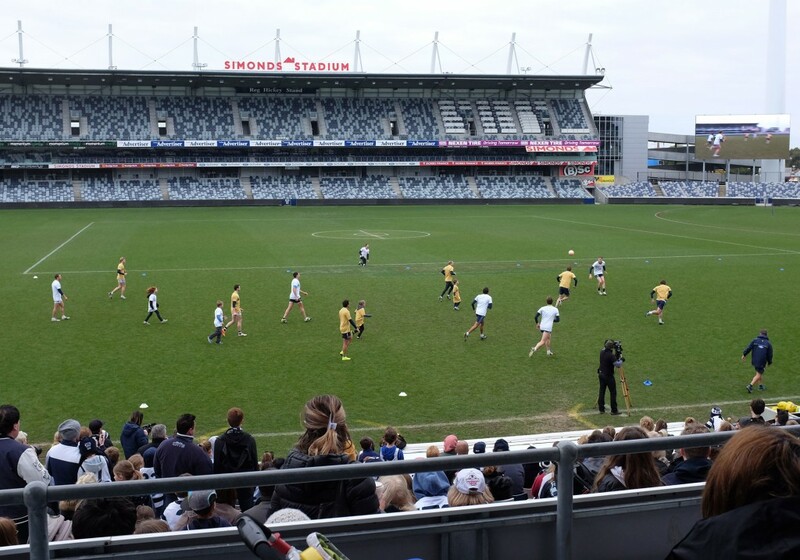 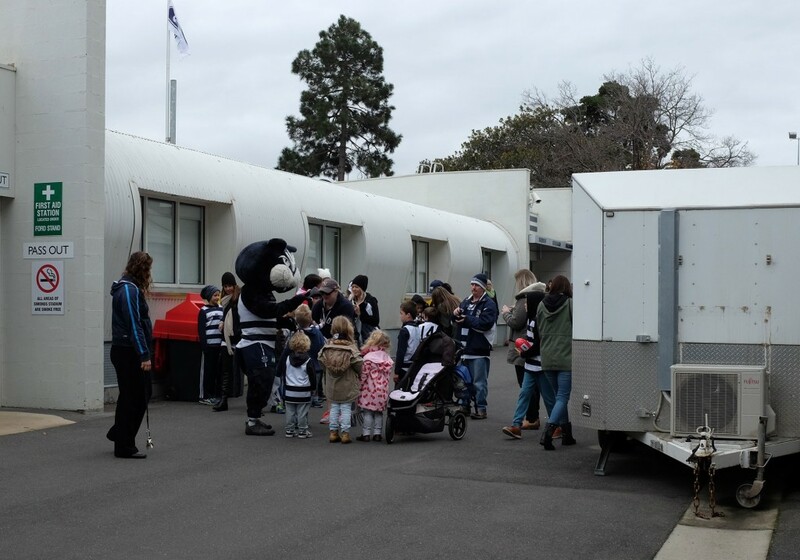 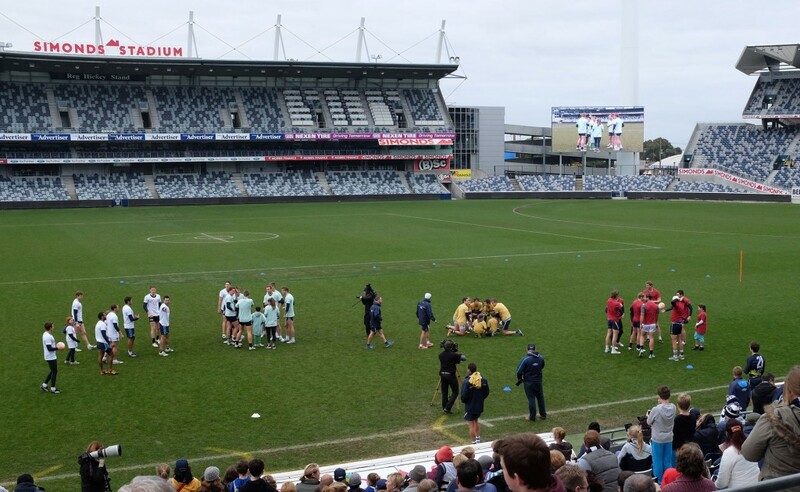 The Cats players were so good with the kids…it was great to see! 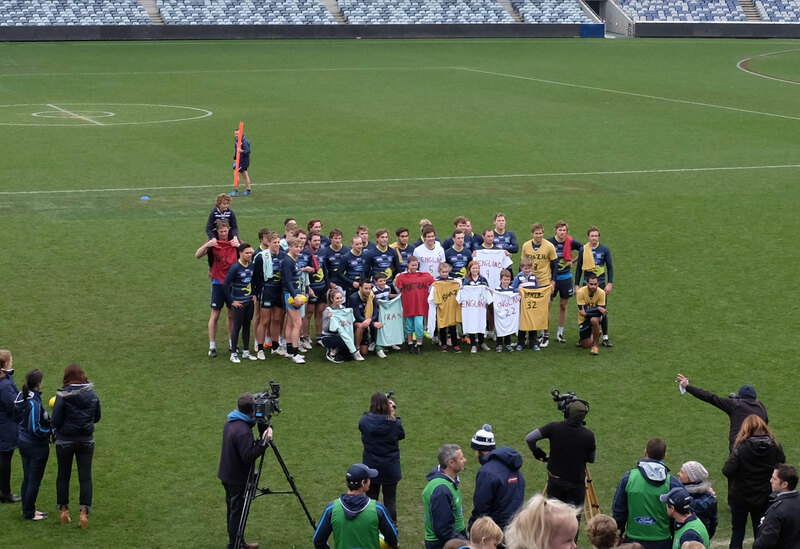 And a team photo was taken at the end…those kids will certainly have something to talk about when they get back to school after the holidays! We tried to find Andrew Mackie, but he wasn’t out on the ground…we did find his name on the players roll…he was drafted in 2004, and has been in three premiership wins! 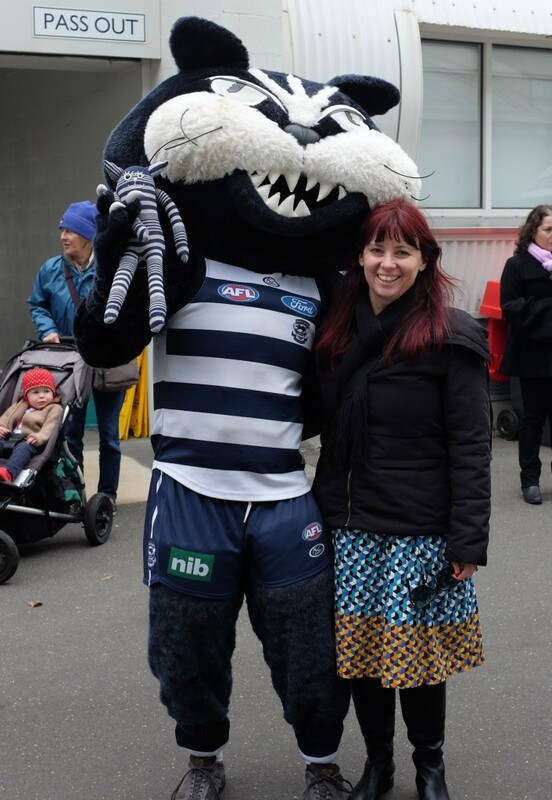 It was a shame we couldn’t find the player we wanted to…..but we did find the club mascot, Half Cat…..
Would love to know what whoever was inside that suit was thinking…probably who is this crazy woman?! 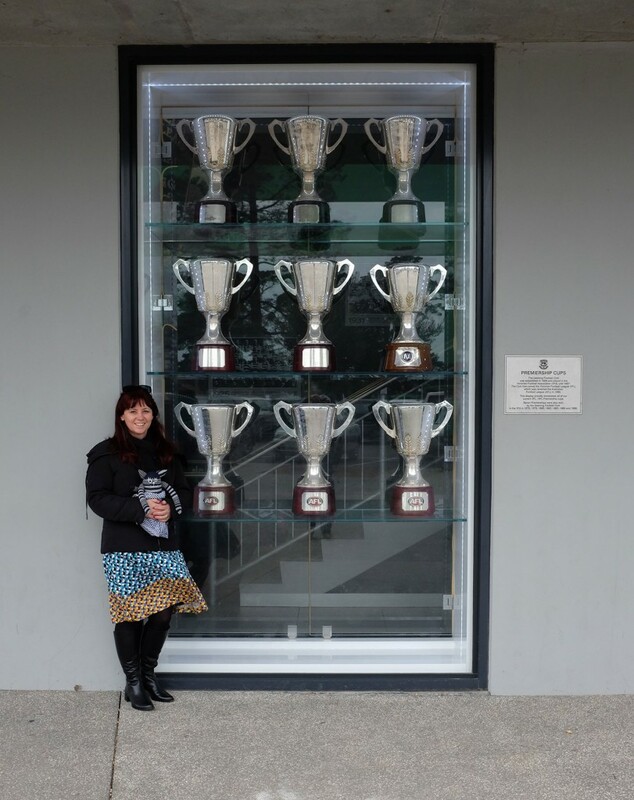 We then walked around the back of the stands, and showed Mackie the Premiership Cups…winners! 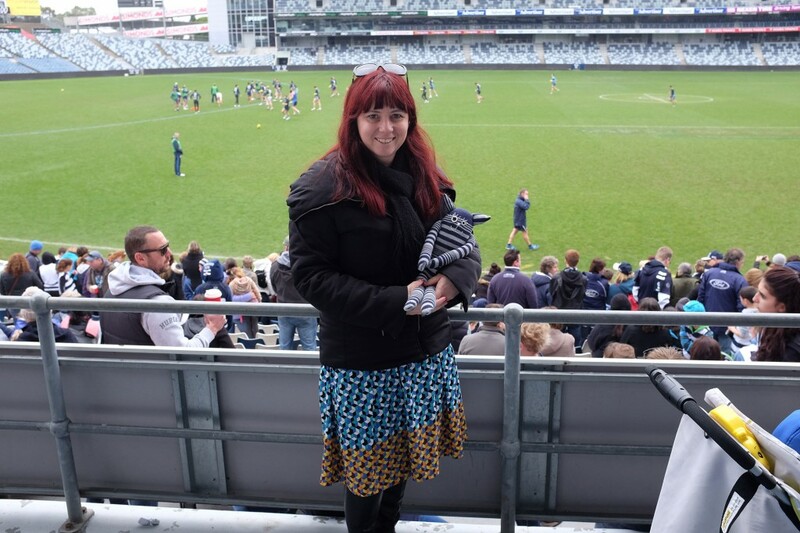 And yes, it was windy and freezing standing there…. 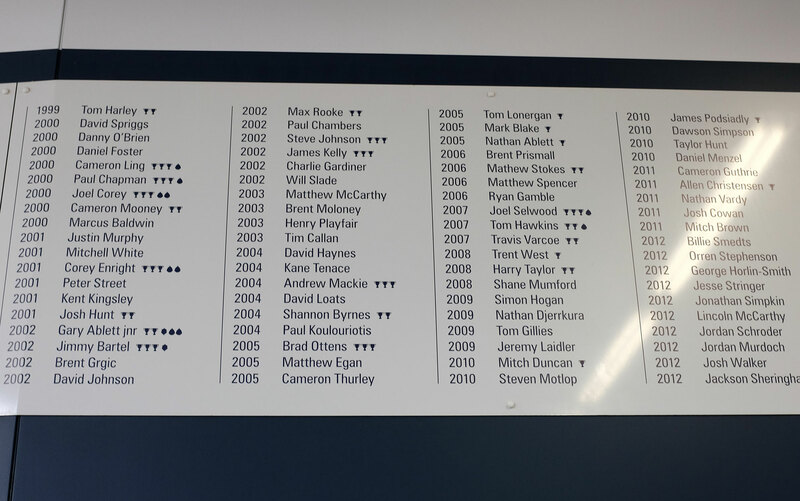 We then found a wall mural, showing the height of various players….Dawson Simpson is the tallest…and I don’t even come up to his shoulders….not even close…. 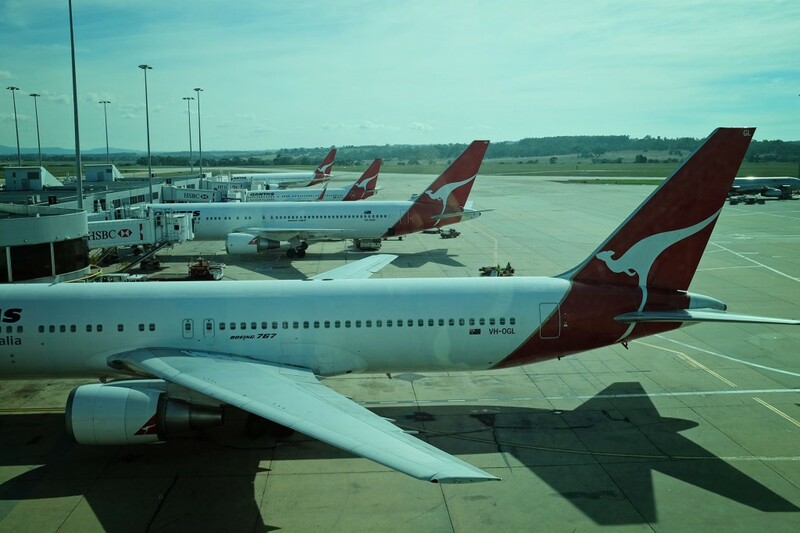 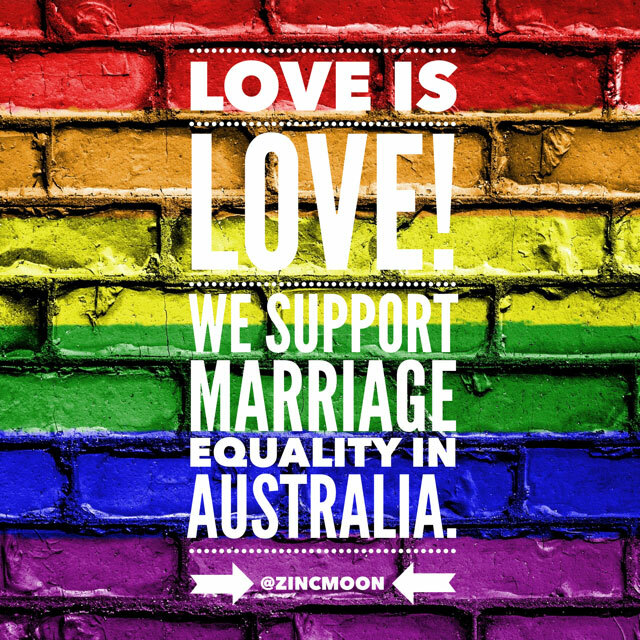 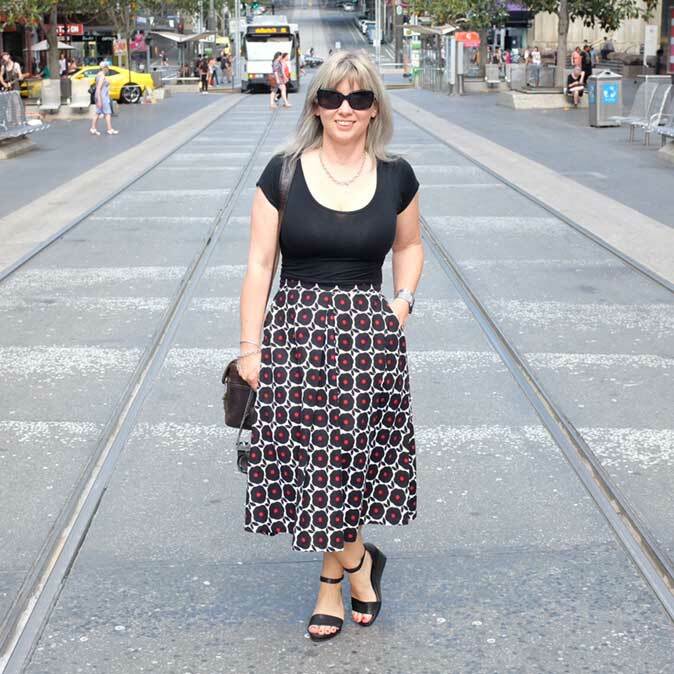 Yep, I am very short…. 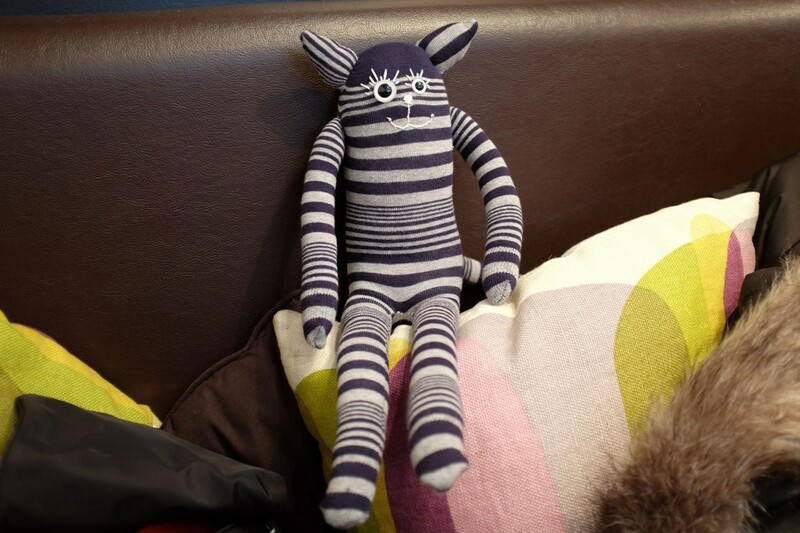 Mackie is a creation from Gus and Ollie….click here to visit the website for more info!